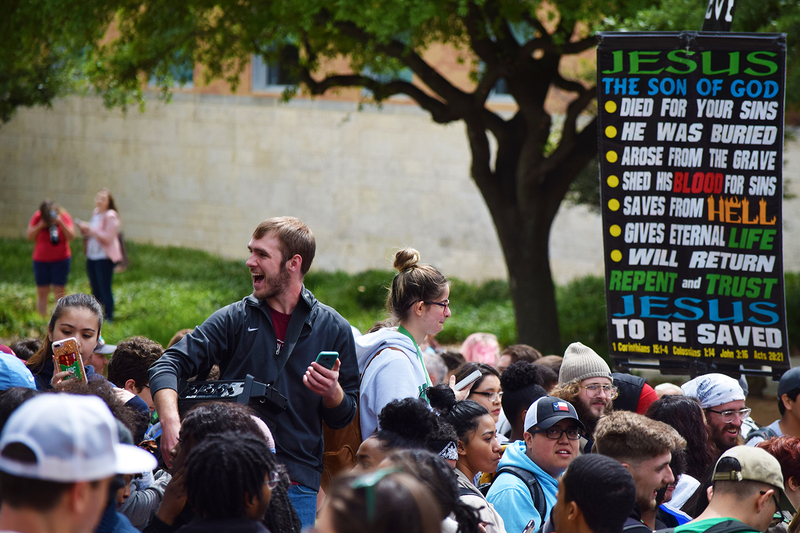 UNT students and counter-protestors gathered outside of the Library Mall Thursday as a group of street preachers visited the university carrying signs that read “Got Aids Yet?” and “BLM Rent a Riot” on them. 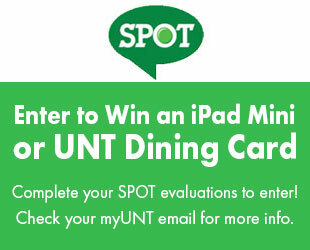 Previously, the organization held an “outreach” event at UNT, which drew demonstrations and counter-protests from students last year. A student blasts music through a speaker to drown out the street preachers. Image by: Mallory Cammarata. 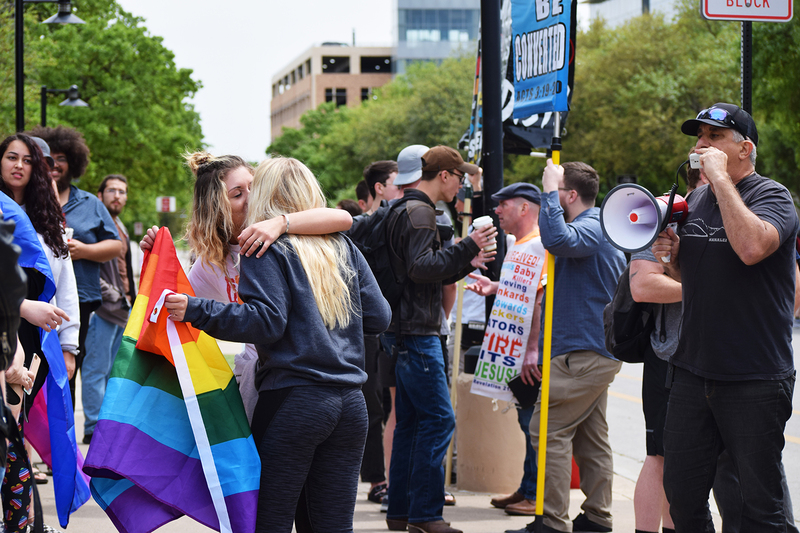 During the protest, members of the National Street Preacher’s Conference displayed signs which read that “Potheads, drunkards, hotheads, femi-nazis, gossipers, news junkies, ex-monkeys,” along with members of the LGBTQ community, were “sinners” who would “go to hell” if they did not repent. Criminal justice freshman Ashton Jackson and hospitality management freshman Shyan Peacock, who are not in a relationship and shared a kiss while holding a sign in front of the street preachers that read “I Love My Girlfriend,” said that although they respect everyone’s opinion, it should not be done in a hateful way. Two students kiss while holding the gay pride flag in front of a street preacher. Image by: Mallory Cammarata. Peacock acknowledged that although she and Jackson are not in a relationship, their kiss was meant to be empowering. Toward the end of the event, a counter-protester was detained and arrested after seen fleeing from UNT Police on foot. Biomedical engineering freshman Zoë Miller said the individual “flicked” street preacher Jim Gilles’ “Make America Great Again” cap before attempting to evade. Gilles has been involved in several civil rights lawsuits challenging university attempts to either stop or limit his preaching. Previously in 2016, Gilles threatened to sue the University of Oklahoma after he was asked to leave the campus following a rally against him, according to Oklahoma City News 9. The National Street Preacher’s Conference and outreach returned to campus at the same location Friday. 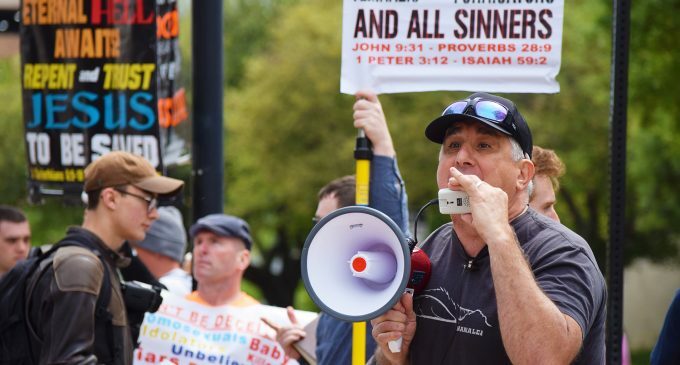 Featured Image: A street preacher shouts into a megaphone as part of the National Street Preachers Conference. Image by: Mallory Cammarata. Poor babies just can’t digest any opposing viewpoints. Sad.